Some EDI Trading Partners require UCC Labels on shipments. Using the Print / Export Shipments utility, Acctivate can print these labels or export shipment information for your packages. Once finished, you have the option to Finish the process, Restart, or Cancel. If you select to Finish the process then the shipments will be marked as “Printed” in the database. They will no longer show when you select to print new shipments. If you enter a shipment number for Restart then Acctivate will start the print new shipments at that number. 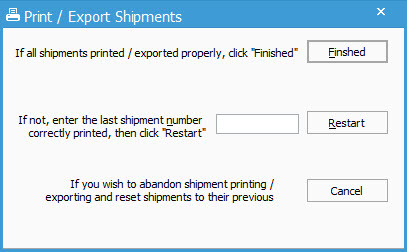 Selecting Cancel will not mark any shipments as printed. Select Reprint / export shipments to print UCC labels you’ve already printed. Choose whether you would like to print All, based on a specific Created on date of the original shipment, or a range of Shipments previously printed. Once finished, you have the option to Finish the process, Restart, or Cancel.